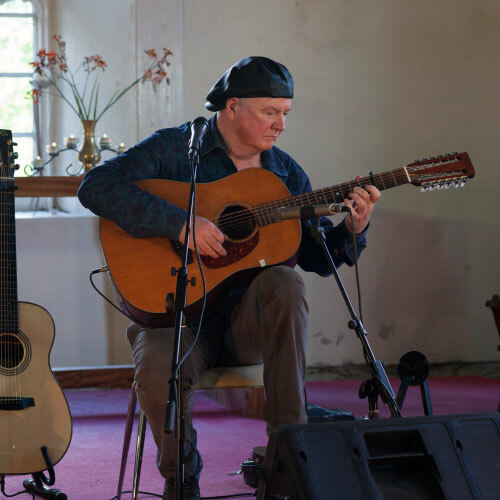 Guitarist, songwriter and record producer Gerry O’Beirne is a master of the six and twelve string guitar and a number of other stringed instruments. His lyrical and passionate songs have been recorded by many artists in Ireland and around the world. He has released three albums of his own music and toured the globe both as a solo artist and with Irish musicians like Martin Hayes, The Sharon Shannon Band, Andy Irvine and The Waterboys. He has performed at the White House and on ‘Prairie Home Companion’, the weekly Public Radio show hosted by the legendary American author Garrison Keillor. Gerry has opened for The Grateful Dead, and played electric guitar with Marianne Faithfull. As a producer Gerry has a large number of albums to his credit, including Promenade for Kevin Burke and Micheal O’Dhomhnaill (winner of the Grand Prix Du Disque at Montreux).